Our Kindermusik Musical Playdates are one-time only classes for families. Enjoy all of the singing, fun, learning & more of a Kindermusik class without the commitment! Playdates are better with friends, so bring a friend (or two) and join us today! Each month we offer different themes for our playdates. And the best part? Every child goes home with an instrument and music! Our Musical Playdate schedule is constantly changing, and more dates and times may be added. We encourage you to check back often or contact us directly if you are looking for a specific time. Our Musical Playdates cannot be used as a free preview class. Please Note: A minimum number must be met in order for a playdate to occur. This minimum needs to be met 24 hours or earlier so that we can determine if a particular date will hold. Due to rental fees, teacher fees and quality assurance, we reserve the right to cancel any classes that do not meet this requirement. Please get your registration in at least 24 hours prior to class day if not earlier so we can ensure your preferred class holds. Thank you! Brrr! Let's bundle up and wobble like penguins, pretend to be polar bears, and listen to the snowflakes fall. While we're doing that, we'll be developing our sense of balance, imagination, and listening skills. Come play in the cold with us – we promise you'll stay warm! 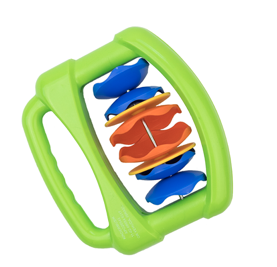 The easy-to-grip molded handle on this 4 ¾” x 3 ¾” mini tambourine makes music-making a breeze for even the smallest instrumentalists. The durable plastic case safely houses four pairs of 1” jingles that clink and clang at the slightest movement. For ages 8 months and up. Share the love with these love-themed activities! We'll play shakers to "I Love the Mountains," circle dance to "Love Somebody," listen to "I Love My Family," and cuddle and rock to "Let Me Call You Sweetheart." And you just might find a special song or instrument to love, too! 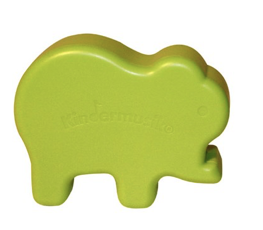 This colorful percussion shaker, shaped like an elephant, is made of sturdy hard plastic that is phthalate and BPA free. It is easy for children 12 months and up to hold (3 1/2" x 2 3/4" x 1 1/4"). Moving the elephant in different ways and directions automatically produces cascades of "popping" sounds. Put on something green and come with us as we visit magical Ireland and its music! We'll bounce to an Irish trot, play instruments to "All the Way to Galway," and relax to an Irish lullaby. We'll also pretend to dive and swim like seals off the coast, and have fun making ocean waves with a sheet! Add fun and whimsy to any movement, pretend-play, or peekaboo activity with the brightly-colored 30" x 30" Kindermusik scarf. Lightweight and sheer, with hemmed edges for durability. For all ages. 100% polyester. Colors may vary. It's time to discover our world and all the natural beauty it has to offer. We'll use our imaginations (and a hoop) to float down a river, listen to animals as we move quietly through a forest, and enjoy a circle dance on our very own island paradise. At the same time, we'll learn a little about the environment, and how important it is to protect it. ALL Kindermusik Playdates include a Music Download Gift Card! 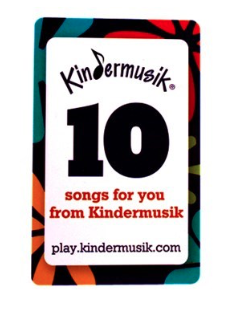 Select and download your 10 favorite Kindermusik songs from play.kindermusik.com with the Kindermusik Download Card. Search the entire Kindermusik catalog of songs by age of child, style or theme to find the perfect songs for your own special album. Download to any device for listening enjoyment whenever and wherever your child might go!